Futronic’s FS80H USB2.0 Fingerprint Scanner uses advanced CMOS sensor technology and precise optical system to deliver high quality fingerprint image. It can capture an almost un-distorted raw fingerprint image into PC in 100ms. So it is good for any fingerprint recognition application. Special electronic circuit is built into FS80H to do Live Finger Detection (LFD). With appropriate software in PC, user can select this LFD feature so that only live finger’s fingerprint will be scanned into PC. Fake fingers made from silicone rubber, play-doh, etc, will be rejected. And the LFD feature is included in all Futronic’s standard software. Used in Windows Hello in windows 10. The authentication and attendance software must be developed on Futronic SDK or SDK which is compatible with Futronic devices. The free scan API (with source code) will be provided to capture the fingerprints where matching is not required. 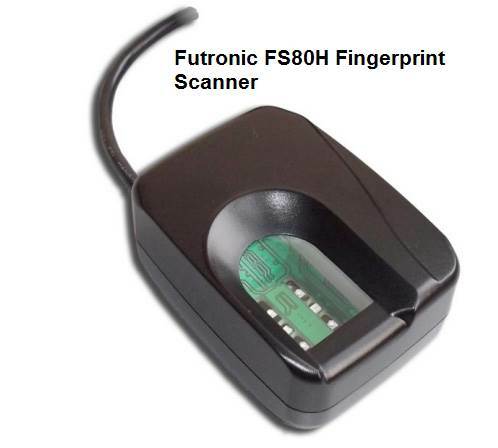 Futronic provides USB drivers and API for FS80 to capture a raw fingerprint image. If a customer wishes to develop an authentication system in which matching is required then he can use Futronic SDK. The Futronic SDK is available for Windows, Linux/Android, and MacOS separately. An ANSI ISO SDK is also available which is used to generate ANSI/ISO standard fingerprint minutiae template from the captured fingerprint image. Futronic FS80H Pro USB 2.0 optical fingerprint scanner technology for fingerprint identification systems, biometric devices, time clock software, and biometric access control. The FS80H is a high-quality optical fingerprint scanner with a rugged case and tough crown glass window. Futronic’s FS80H USB 2.0 Fingerprint Scanner uses advanced CMOS sensor technology and precise optical system to deliver a high-quality fingerprint image. It can capture an almost un-distorted raw fingerprint image into a PC in 100ms, making it ideal for a fingerprint recognition application. Its finger scanning window is 14mm thick, which means it is much more reliable and robust compared to any semiconductor-type fingerprint sensor. The finger is illuminated by 4 infra-red LEDs during scanning and the light intensity is automatically adjusted according to a fingerprint’s characteristics (wet, dry, blurred, etc) to optimize the quality of the captured fingerprint image. A special electronic circuit is built into the FS80H to do Live Finger Detection (LFD). With the appropriate software in a PC, a user can select this LFD feature so that only a live fingerprint will be scanned. Fake fingers made from silicone, rubber, play-doh, etc, will be rejected. Futronic’s FS80H USB2.0 Fingerprint Scanner uses advanced CMOS sensor technology and precise optical system to deliver high-quality fingerprint image. It can capture an almost un-distorted raw fingerprint image into PC in 100ms. So it is good for any fingerprint recognition application. The special electronic circuit is built into FS80H to do Live Finger Detection (LFD). That is, with appropriate software in PC, the user can select this LFD feature so that only live finger’s fingerprint will be scanned into PC. Fake fingers made from silicone rubber, play-doh, etc, will be rejected. And the LFD feature is included in all Futronic’s standard software. The image format is 8 bit 256 grayscale. USB 2.0 compatible interface, plug and play device. WHQL approved for Vista 32&64 bit. Android 3.1 and higher with USB Host port.